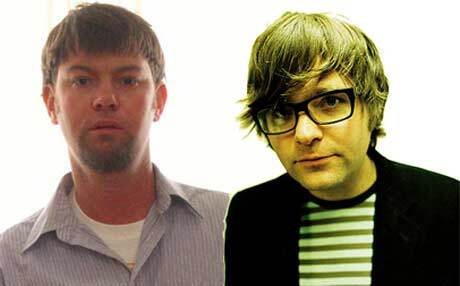 As we reported previously, Death Cab For Cutie ringleader Ben Gibbard has been hard at work on a collaborative album with Son Volt front-man Jay Farrar. The album, called One Fast Move or I'm Gone: Kerouac's Big Sur, is a collection of songs dedicated to celebrated beat writer Jack Kerouac. The pair started off writing songs for the soundtrack to last year's Kerouac documentary, which shares the album's name, but decided to turn their collaboration into a full album. Now, Billboard is reporting that the record will be out on October 20 via F-Stop/Atlantic. The album apparently takes 90-percent of its lyrics from Kerouac's Big Sur, and has been a three-year work-in-progress. "It wasn't so much an effortless recording session, but it felt like the songs were in the driver's seat," Gibbard told Billboard. "We were very conscious not to overproduce them and add layers of vocals or overdubs. In my own home demoing, I'm a flagrant overdubber. They [Farrar and multi-instrumentalist Mark Spencer] kept it really sparse, and I'm really drawn to that - how few things are happening; there's not a lot of adornment around [the songs] and I like that." One Fast Move or I'm Gone: Kerouac's Big Sur will be available as a regular CD, a CD/DVD bundle, a box set packaged with the CD and DVD, the novel, and a 40-page book on the film and finally a vinyl version. According to Farrer, a North American tour is being tentatively planned for late October in support of the record. 6. "These Roads Don't Move"
8. "One Fast Move or I'm Gone"